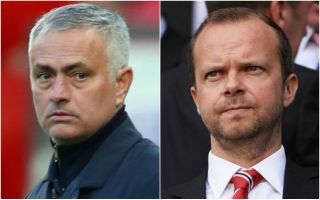 Manchester United manager Jose Mourinho reportedly missed out on three centre-back signings because of Ed Woodward in the most recent summer transfer window. Those centre-backs were Toby Alderweireld, Jerome Boateng and Harry Maguire, according to the Manchester Evening News. The report explains how all three players were Mourinho targets, only for Woodward to veto them for a variety of reasons. According to the MEN, Alderweireld and Boateng were deemed too short-termist by the United executive vice-chairman, while Maguire was considered not to be enough of an upgrade on the Red Devils’ current options at the back. Fans probably won’t be too pleased with that lack of judgement from Woodward, with the team clearly suffering due to a lack of investment in the summer, particularly with some dodgy defensive displays. MUFC have a negative goal difference after 12 Premier League games, conceding 21 times already, with players like Chris Smalling and Eric Bailly looking unconvincing for most of the campaign. One imagines any one of Alderweireld, Boateng or Maguire could have significantly improved United’s fortunes, and it seems bizarre that Woodward wouldn’t trust Mourinho’s judgement on those potential signings a bit more.